How does QE reduce long-term interest rates? Quantitative easing (QE) aims to reduce long-term interest rates, either broadly or in specific markets. Empirical evidence suggests that QE has indeed been effective. The preliminary experience with QE by the ECB’s QE lends further support. Yet, we still do not know exactly why QE programmes are effective at reducing long-term interest rates. The literature has focused on two main channels of transmission. One is a signalling channel, which works through lowering market expectations about future policy rates (see, e.g., Bauer and Rudebusch 2011 and Christensen and Rudebusch 2012). Another is a supply-induced portfolio balance channel arising from reductions in the supply of the purchased asset available to market participants (see, e.g., Gagnon et al. 2011 and Krishnamurthy and Vissing-Jorgensen 2011). In a recent paper, we argue that the expansion of central bank reserves that is a defining feature of QE programmes, is likely to also play an important role in the transmission (Christensen and Krogstrup 2015). The basic idea builds on Bernanke and Reinhart (2004) who suggest that an expansion of reserves could give rise to asset price changes through portfolio balance effects. Our contribution is to propose how this channel might work. Central to our argument is that central bank reserves can only be held by banks, and that this segmentation of the market for reserves matters for how central bank asset purchases affect private financial sector balance sheets, and hence, the financial market reaction. Short of a full-fledged model, we propose a mechanism in the form of a stylised example. Consider a financial system consisting of a banking sector, a non-bank financial sector, and a central bank. 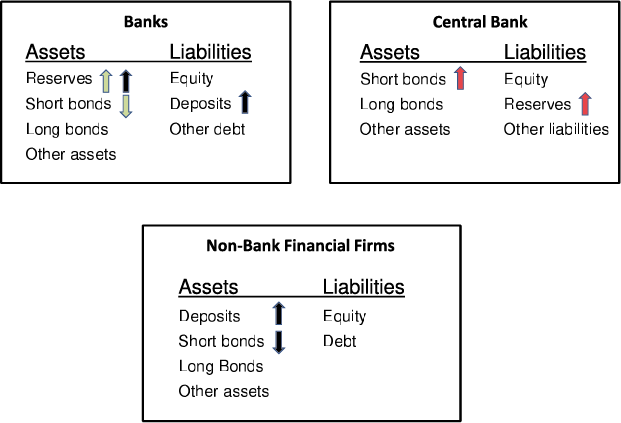 Figure 1 illustrates the aggregate balance sheets for these types of financial institutions. Suppose that there are four types of financial instruments, namely short-term bills, long-term bonds, deposits, and central bank reserves. Bills and bonds are in a fixed supply. The central bank has a monopoly on issuing reserves. Only banks can issue deposits. Both banks and non-banks can hold deposits, bills, and bonds, but only banks can hold reserves. Suppose further that short-term bills and reserves are highly substitutable from the point of view of reserve holding banks, and that non-bank financial institutions consider bank deposits and short-term bills to be highly substitutable at the zero lower bound. Note: Stylised balance sheets of three key players in financial markets: the central bank, reserve holding banks, and non-bank financial institutions. The central bank can transact with both types of institutions. Now consider the initial impact on the various balance sheets of a central bank purchase of a short-term bill, and consider an impact period sufficiently short so that banks do not adjust their credit portfolios to changes in funding conditions. The red arrows in Figure 1 reflect changes in the central bank balance sheet. First, suppose that the counterparties to the central bank’s transactions happen to be banks exclusively. The resulting impacts on banks’ balance sheets are given by the green arrows in Figure 1. In the aggregate, the size of banks’ balance sheets is left unchanged, but the balance sheet composition shifts from short-term bills toward reserves. As these assets are highly substitutable, this ‘asset swap’-like transaction would not substantially change banks’ portfolio composition or duration. Also, banks’ liabilities would remain unchanged. Hence, there would be no obvious reason for banks to adjust their portfolios, and no asset prices would change. This is indeed the standard argument against QE in short-term bonds near the zero lower bound. But this is not all that happens. Suppose instead that it is mainly non-bank firms that sell short-term bills to the central bank. The balance sheet implications are now shown with black arrows in Figure 1. Since non-bank financial firms cannot accept reserves as payment directly, the central bank credits the reserves with the correspondent banks, which then credit the deposits held by their non-bank customers. Under high asset substitutability, the balance sheets and portfolio compositions of the non-bank financial firms would be largely unchanged and not provide incentives to engage in any portfolio adjustments. In short, there are no supply-induced portfolio balance effects arising from such central bank purchases. The same is not true for the banks’ aggregate balance sheet, which, as a result of their customers’ transactions with the central bank, has grown on the asset side by the amount of new reserves and on the liability side by the new deposits. Their share of short- to long-term asset holdings thereby increases. That is, for the banking sector as a whole, the duration of the asset portfolio falls. If banks had individually optimised the duration of their portfolio before the central bank asset purchases, then they may seek to make up for the lower duration after the purchases by increasing their demand for long-term assets, while trying to sell reserves or other short-duration assets. This bids up the price (or equivalently, lowers the yield) of long-term assets. This reserve-induced channel differs from the supply-induced portfolio balance channel hitherto considered in the literature by being independent of the specific assets purchased by the central bank. Note also that if a central bank buys long-term assets in a QE programme, both portfolio balance channels can be operating at the same time, and cannot be separately identified empirically. This is the case for all three QE programmes conducted by the Federal Reserve since 2008, and for the Bank of England’s asset purchase programmes. That reserve-induced effects have played a role in the transmission of these QE programmes is nevertheless likely. Carpenter et al. (2013) provide evidence that banks were not the main sellers of assets to the Federal Reserve during its QE programmes. Moreover, the Bank of England’s QE programme was, at least initially, designed to have mainly non-bank counterparties (Joyce et al. 2011). We provide supportive empirical evidence of the reserve-induced channel in Christensen and Krogstrup (2015) by analysing the large expansion of reserves undertaken by the Swiss National Bank in August 2011. These reserve expansions were unique and different from QE programmes implemented at other central banks, in that the Swiss National Bank only acquired short-term claims and left the available stock of long-term securities unchanged. By design, therefore, this programme cannot have had any supply-induced portfolio balance effects on long-term yields. We find that Swiss long-term government bond yields declined following the three key Swiss National Bank announcements, and show that these declines came predominantly from the reserve-induced portfolio balance channel. Our research suggests that the strength of the reserve-induced channel depends on the specific market participants, their asset preferences and substitutability, and market structure in the economy in question. Such features have not yet been analysed in connection with assessments of the effectiveness of QE. If reserve-induced effects are material, the implication is that QE programmes can be implemented through purchases of assets other than long-term bonds and still reduce long-term yields. Carpenter, S, S Demiralp, J Ihrig, and E Klee (2013), “Analyzing Federal Reserve Asset Purchases: From whom does the Fed buy?”, Finance and Economics Discussion Series Working Paper 2013-32, Board of Governors of the Federal Reserve System. Krishnamurthy, A and A Vissing-Jorgensen (2011), “The Effects of Quantitative Easing on Long-term Interest Rates”, Brookings Papers on Economic Activity, Fall 2011, 215-265. Author: Jens Christensen is a senior economist in the Economic Research Department of the Federal Reserve Bank of San Francisco. Signe Krogstrup is Assistant Director and Deputy Head of Monetary Policy Analysis at the Swiss National Bank, and a member of the World Economic Forum’s Global Agenda Council on Global Economic Imbalances. Image: A man walks to work. REUTERS/Toru Hanai.